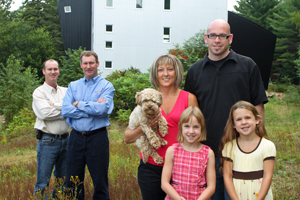 When Tim and Tracy Gilchrist sought an alternative way to heat and cool their non- traditional home in Laurentian Valley, Ontario, little did they realize what a noticeable impact their decision would have on their children and pets. 4,700 square foot, three-storey home (3,500 living space) with two-car garage and basement beneath. GeoSmart Premium G with desuperheater. Upgraded ductwork in mechanical room. Vertical 1 ¼” closed loop. Self-built, the Gilchrist’s five-year old, 4,700 square foot home consists of three storeys with a two-car garage and basement beneath. 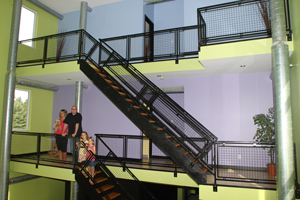 The industrial-style look features a 27-foot opening that runs from the main to the top floor. Shortly after moving into their new three-bedroom, three-bathroom home, not only was the family’s investment in an oil forced air furnace and oil hot water tank becoming expensive, they were having difficulty maintaining a consistent temperature throughout the house. While the top floors were warm, the main and lower floors remained chilly. The Gilchrists turned to MacKinnon Well Drilling for advice on the most appropriate geothermal unit to install. Given the size of the home, the MacKinnon team recommended GeoSmart Energy’s six-tonne Premium G. The system works at low capacity on mild days for exceptional efficiency and automatically shifts to full capacity on days where the temperatures are more extreme. It is the most efficient geothermal unit on the market today. After assessing the two-acre property which contained bedrock, the company, which handles its own drilling, elected to install the geothermal system supported by a vertical loop system. Six holes were drilled into the ground and filled with 1,200 feet of 1 ¼” PEI00 green geothermal pipe. 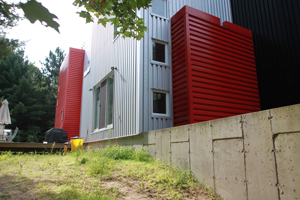 The loop system feeds into the heat pump located in the mechanical room in the basement of the home, using the earth’s natural heating and cooling properties to heat the home in the winter, and cool the home in the summer. “We didn’t have air conditioning in our home before, so the added comfort geothermal brings to our home in the summer months is fantastic,” says the mother of five and eight- year-old daughters. Shortly after the system was installed, Tracy says the family immediately noticed the difference. She noted that the family spends a lot of time on the main floor of the house which houses the kitchen, living room and playroom. Prior to installing geothermal, the concrete floors in this area were always cold. The Gilchrist’s children weren’t the only ones to notice the difference. The family’s two cats used to seek warmth upstairs in the children’s rooms where the sun came in. 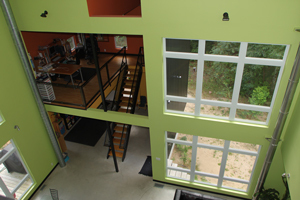 Now, however, they’re content to linger on the concrete floors on the main floor, an indication of the difference geothermal has made in the consistency of the temperature throughout the home. While the Gilchrist’s system has only been in place for six months, Tracy notes they are already noticing the difference in their energy bills. With the installation of their geothermal system and insulation of their basement, the Gilchrists expect to recoup $10,000 in rebates from the government thanks to current energy incentive programs in place.